So I'm curious to know what people are thinking about on this topic. The war on the invitations. Everyone seems to be on the digital trend now-a-days. Snail mail is starting to die out and I'm sad cause I love getting real letters and cards in the mail. But just cause I do, doesn't mean everyone else does. In fact, it seems more people prefer the use of digital invites instead of the traditional. So I'm wondering, which do you prefer to use and receive? I have heard some people say that it's ok to use a digital invite except for wedding and holiday cards. While others have said it's ok to use them for any occasion. I personally have only sent out holiday cards through digital one year before to test it out. I have never used anything such a the "create an event" on Facebook to host a party. Have you used it? Was the success rate better than the typical mailed out invitation? What I have done in the past and I have liked it was mailed out real invitations, but had people RSVP for the parties on a website that I included in the invite or just have them email or call me. I personally have felt that using Facebook to send out an invite just doesn't feel the same or have the same "fun" as getting a real invitation. But that is just me. So I want to know what your take is? 1. 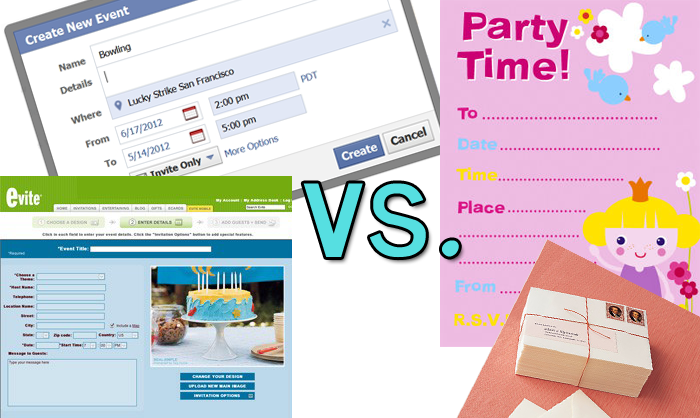 Do you prefer to host a party using digital invites through sites such as Facebook or Evite? 2. Do you prefer to receive a digital invite rather than a paper one? I'm really curious to know your thoughts and views on each one. The fall seems to be a huge time of the year for me where I am party planning non-stop it seems like. With my daughter's birthday in October, my son's birthday in November, and now getting a baby shower underway before the new baby comes in January....well, I have been thinking a lot about how people like to do their party planning now-a-days. Feel free to leave your thoughts and comments!